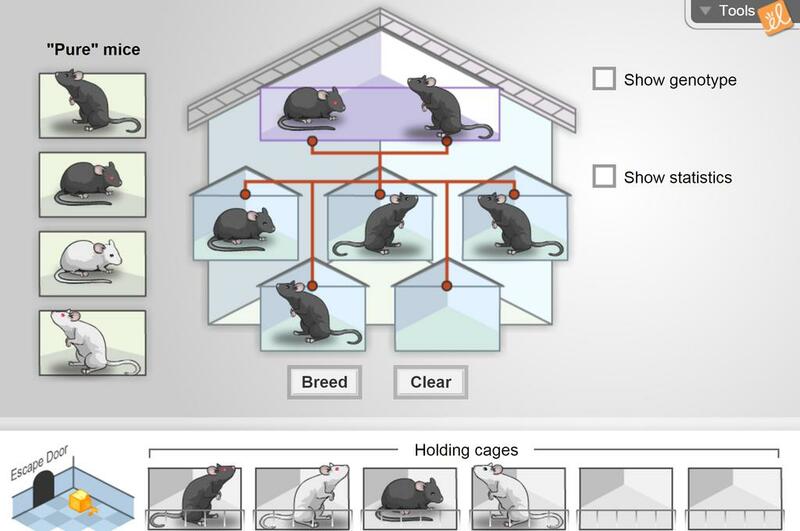 Breed "pure" mice with known genotypes that exhibit specific fur and eye colors, and learn how traits are passed on via dominant and recessive genes. Mice can be stored in cages for future breeding, and the statistics of fur and eye color are reported every time a pair of mice breed. Punnett squares can be used to predict results. reed "pure" mice with known genotypes that exhibit specific fur and eye colors, and learn how traits are ... (more)passed on via dominant and recessive genes. Mice can be stored in cages for future breeding, and the statistics of fur and eye color are reported every time a pair of mice breed. Punnett squares. This worksheet allows students to evaluate the phenotypes of a litter of mice and state a claim answering... (more) the question, "What are the genotypes of the parents of this litter?" Students then support the claim with evidence and reasoning and then engage in scientific argumentation with a peer. One of my all time favorite titles for showing math and science relationships. Excellent real-world connection for teaching theoretical and experimental probability.